I can’t believe Christmas is in less than a month! I’m not a big fan of starting Christmas preparations early, but with a toddler, I need all the time I can get! This year we are making our own advent calendar. It was actually quite simple. 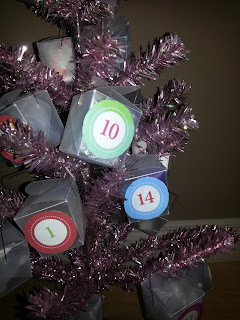 I purchased 24 wedding favor boxes, I added numbers to them, and then I hung them on a mini Christmas tree. Each little box will contain either a chocolate or little gift. And I might even include little festive event ideas, for us to do! Here are some other great ideas for Advent Calendars, with a free printable pdf of “event ideas” from www.thepetitcadeau.blogspot.ca when you sign up for her newsletter. I am also always looking for cool Christmas events to attend. Here is one I just heard about, The 3rd Annual Gingerbread House event. It is on Dec 16th this year at the Parkinson Rec Center, and not only can you attend but you can also enter! Check out all the beautiful Gingerbread Houses and help raise money for a good cause, the Okanagan Boys and Girls Clubs Cool Moves Program . Details are available at www.gingerbreadcompetition.ca.